Thanks! 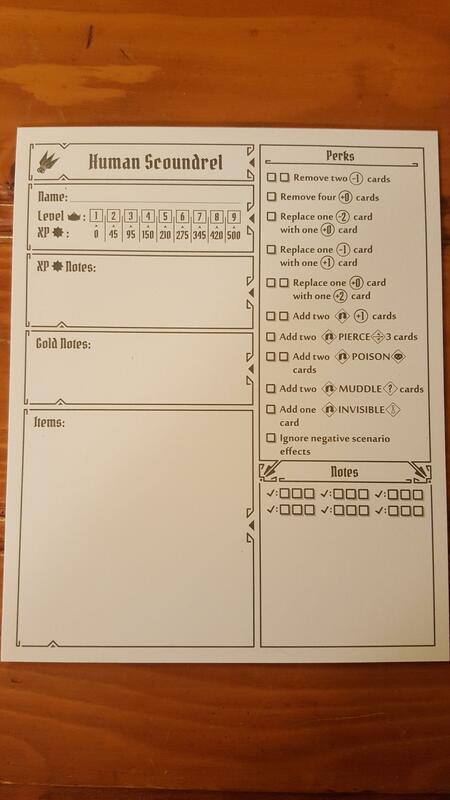 I ended up starting a campaign with a friend over the weekend and neither of us picked Scoundrel, but I'm looking to bring in a third or fourth person and having that perk list is helpful. I liked the game so much I'm getting one of the game organizers, as well as a set of reusable sticker and card sleeves, to preserve the replayability. Two of my friends who own the game have done the same, getting organizers and sleeves for everything. I would imagine you could contact the company about the missing pad, though really you can get by with a regular sheet of paper as long as you have the perk list. If you go to the BGG Gloomhaven page they have "ready-to-print" character sheets in the "Files" section. I spent much of last night assembling the Broken Token organizer insert for Gloomhaven, and I was surprised (even though I shouldn't be) at how well it all fit together. I look forward to using it next time I play (hopefully Sunday). For those of you who play, do you have much experience with drop-in players here? I can't round up three other consistent players, but I think I can manage 2 and several occasional drop-ins; does having a constantly-shifting party makeup have much effect? A small amount, but it depends on how you implement the drop-in players. Bear with me for a minute. 1) In a solo game, there are "virtual" players for as many characters as the player wants to run simultaneously. When a character for virtual Player1 retires, the retirement bonus goes to Player1's second character. If all your drop-in players are "Player4", then you will have fewer issues, but it means all your Drop-in players will have to play whatever character was set up for Player4 at that time. 2) If each drop-in player is their own "Player", then you will have issues with drop-in players having fewer retirement Perks as the campaign progresses. It will also be harder for drop-in players to reach retirement goals. This style will also mean you'll have to be changing the Attack Modifier Deck if the drop-in players change, since the perks for the classes are different. Finally, you can't have two characters of the same class going at the same time, which means for each drop-in player, you potentially reduce the number of class options for consistent players. Overall either of these will work, and the impact will probably be relatively minor. If I was consistently playing the game with drop-in players a possibility I'd probably push for option #1 for drop-in players. I played the Tinkerer on a single non-campaign mission, and the other two won't be unlocked until the current crew retires. Generally speaking, do you think this combination will work well? PS with these classes, the only class left to unlock is squid-face. I'm almost certain that I won't be able to hit Prosperity 9 by the end of the campaign though. Heck, it'll be somewhat of a stretch to get to Prosperity 8. Can't say- I haven't unlocked those, nor played the Tinkerer. The Tinkerer is the one starting class I have a block about playing- having a hard time getting over that it only gains experience on Loss cards. My wife is currently playing Squidface and not having fun. I think it's a pretty powerful, effective class, but it's less about direct effects and doesn't mesh well with her personal quest. I think next time we're going to do the quests to retire my Sun, and let her retire at the same time. Before that, though, we might make another trip to scenario 72. Set it at easy and see what my refined perk deck does to it. And we're currently between 4 and 5 prosperity, so 9 seems very far off. If you're only playing two characters, I'm not sure Prosperity 9 is possible. It might be possible with 4 characters, but 3 looks iffy (and that's after I've incorporated the mini-campaigns into the main campaign to get 20 more missions). We're a three player group (might be adding a fourth), but just heading into our second round of retirements. And since we're playing about once a month right now, we'll have the expansion before we close out the campaign. Had the second session with my Cragheart replacement for my original character. It was also the retirement session for our group's Spellweaver. Remember the bit upthread where I lamented not feeling sufficiently challenged? This scenario pretty much said, "I got your challenge right here." To make matters worse, one of the players made a decision which put their character and two of the three other characters in dire positions as two of the characters immediately lost half their health, stood to lose the other half on their next turns, and left the third character completely surrounded by enemies with the boss--yes, it was a boss scenario--one further step away along with what other enemies could not move to surround (though as they had ranged attacks they had no need to try to get closer). Having openned the door to the boss room the thinking was the scenario was over and it was time to restart playing it from the top. But we figured a heroic loss would be entertaining and played on. Fortunately we had enough control to use to prevent ourselves from being slaughtered, but each time we thought we saw an avenue to turning the odds in our favor a summons, whiff, or freakish initiative draw worked against us. Thankfully the scenario objective remained clear in everyone's mind--killing the boss. So while we are not a great ranged damage group, we focused low damage, area control attacks at the boss and were able to survive long enough to pull out a win (aided by wounding and poisoning the boss). This will be the first unlock character to see play in our group.